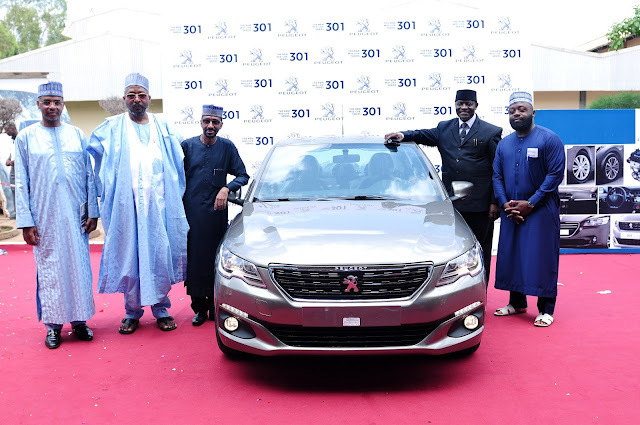 PAN Nigeria Unveils 301-Wildfire Car - AutoReportNG "AutoReportNG-The No 1 Car Blog In Nigeria That You Can Trust - AutoReportNG"
Speaking at the unveiling, the Managing Director of PAN Nigeria Limited, Alhaji Ibrahim Boyi said that since announcement of the 301 series, the auto firm has recovered its customers and market share which has improved from 6% in 2015 to 8% in 2016. Boyi who pointed out that PAN wants to reconnect with the emotions and heritage of the brand added that the brand covers all age groups and that is why there is strong emotional connection. 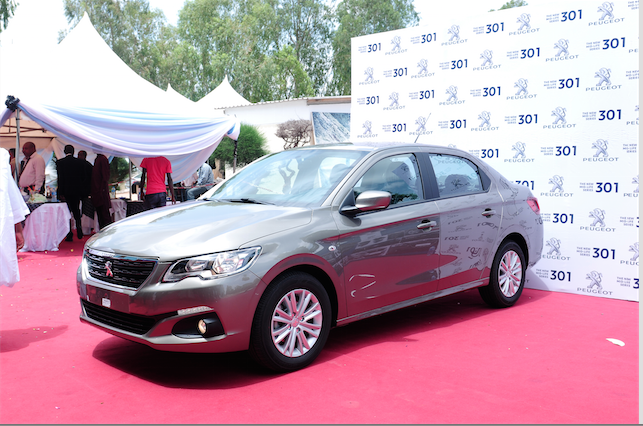 Putting the price of the new 301 at N5.6 million, Boyi said the car is the cheapest in it class, stressing that there are a large number of Nigerians who like simple functional vehicle like 301. 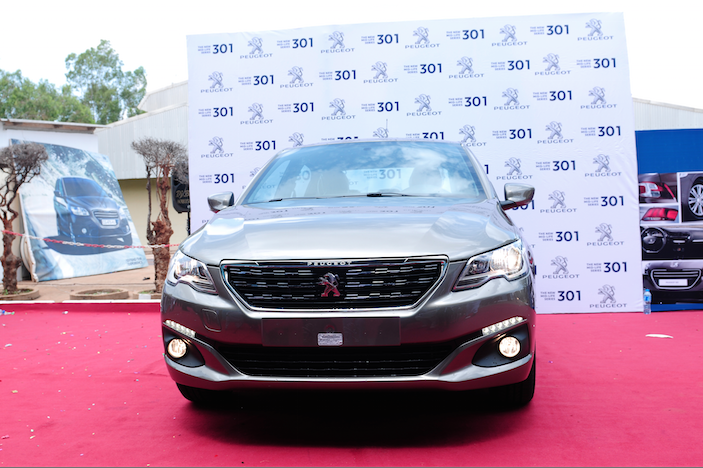 Listing ground clearance, safety features, space, reliability and comfort as some of the unique advantages of Peugeot 301 Midlife, Boyi said “The new Peugeot 301 reinforces it’s qualities with new assets. The body is dressed in the latest stylistic codes of the brand. The vertical grille, body set spotlight and neat adjustments embody the sturdiness of the car. The luminous signatures, incorporating LEDs at the front are expressions of the technological content”. Also speaking was the Yerima Zazzau, Alhaji Munir Ja’Afaru who confirmed that 301 is a fantastic vehicle, just as he appealed to Nigerians to patronize made-in-Nigeria vehicles. Hon Nasiru Babale, representing Tarauni Federal Constituency, Kano applauded PAN, saying that the new Peugeot is a good one and that Nigerians should patronize the product. He however, noted that the House had decided to buy Peugeot for their members for their oversight functions due to the unique attributes of the brand. According to the GM, the body is dressed in the latest stylistic codes of the brand, laced with striking vertical grille, body-set spotlights even as neat adjustments embody the sturdiness of the car. Bawo said that the luminous signatures, incorporating LEDs at the front, are the expression of the technological content. This Peugeot 301 offers considerable skill and trunk volume, dynamic behaviour and a design adapted to local requirements. “At the front is a powerful front face with a wide vertical grille (‘Hot Chrome’ on Allure level or with ‘Chrome Pack’ in Active) surrounding the lion that epitomises the brand’s traditional logo” . An even more feline look, with refined lights incorporating the “tooth” going up largely is found the optical block. These headlamps, with black and chromed masks and LED daytime running lights integrated into the bumper, contribute fully to the modernity and identity of the new 301. “The horizontal hood contributes to the feeling of robustness that emerges from the car. That also results in a retracted positioning of the bumper of the new grille for better resistance to small shocks. Laterally, any curious observer would easily notice a “horizontal” hood and new rims for more dynamism”, he said. Furthermore, the new 16 ” wheels highlight the dynamism of the car. The ‘Albury’ style steel rim offers a 16″ economical offer with a rewarding style. The Perth diamond rim brings a lot of dynamism to the profile of the car and participates in the sense of upscale. “The new car has Triple Play compatible Mirror Screen, to duplicate the smartphone content on the touchscreen of the vehicle. USB connectivity, Bluetooth. It offers unprecedented safety and comfort for the driver and passengers in terms of ergonomics, driving position, height adjustment of the seat and steering wheel with touch screen at the fingertips and eyes, comfortable seats ensuring lateral support and comfort on all types of roads”. It would be recalled that the present model won the Nigeria Auto Journalists Association (NAJA) Car-Of-The-Year (COTY) Award in the country in 2016.